Because it weighs one third less than lead, steel shot has a tendency to lost some momentum after being fired. 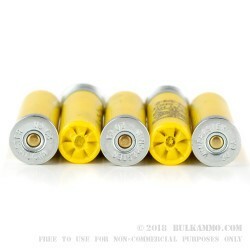 This 20 Gauge shell compensates for that with its impressive 1,325 fps muzzle velocity, which will help you close the distance between yourself and game or targets fast. This corrosion resistant #6 steel shot is perfect for ranges that don’t allow lead, as well as environments you’d rather not pollute -- such as the beautiful places where you enjoy hunting for waterfowl. Winchester avows that it meets federal and state lead free projectile regulations, so you’re completely covered wherever you go. This shell additionally features a thicker wad segment, which will protect your barrel while firing. This shell is backed by multiple pedigrees. 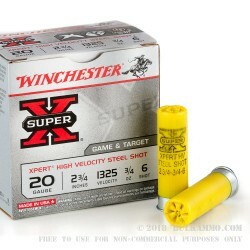 Winchester itself has fostered a stellar reputation over the past nearly 150 years, and their Super-X line of ammunition has satisfied the lofty standards of shooting enthusiasts since its introduction in 1922. This shell is manufactured by Winchester’s Olin division, which provides ammunition to the U.S. military -- their standards are lofty indeed!